This review was originally published in Swedish on website of the Swedish Mises Institute in January 2016. Ben Bernanke was the chairman of the U.S. Central Bank, 'The Federal Reserve', 2006-2014, and nowadays blogs for the Brookings Institute. In late-2015 he released a book, his memoir, of the crisis, titled The Courage to Act: A Memoir of a Crisis and its Aftermath, which I reviewed in Swedish not long after. This piece has been translated and re-worked from the Swedish version. Since I recently discussed Bernanke's "Firefighter Analogy" that appears in the book, I figured it was finally time to bring this 1500-word review onto Life of an Econ Student. 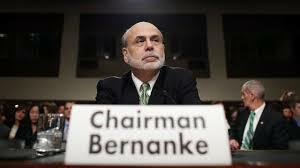 Summary: An exciting book that mixes Bernanke's personal life with his political achievements. If you can stomache his naive view of the crisis as created by a lack of regulation and by bankers' greed, as well as his somewhat clumsy and lazy academic analysis, it is a book well worth reading: about a smart and hard-working man with benevolent aims but with brutally mistaken convictions and methods at his disposal. Little over two months ago [October 5, 2015, this piece was writting in late-2015, and published in January 2016], Ben Bernanke, the former chairman of the American Central Bank ("The Fed") between 2006 and 2014, released his perspective of the financial crisis and its aftermath. It is an autobiographical approach, a story beginning with Bernanke's childhood in Dillon, S.C., and continuing through his college years in Harvard and MIT, his early academic life in Stanford and Princeton before he entered the political game of Washington. It is not exactly an academic book, even though it deals with academic topics, and his editors have done a great job of translating often arcane economic reasoning into comprehensible English. The beginning of the book even contains a 20-page description of the post-war trends in economic research, where confusing trends and groups of various economic schools is neatly laid out (Neoclassical, Neo-Keynesian Synthesis, New Keynesian, New Classic etc.) Even Austrians, who often somewhat lazily throw them all together under the misleading heading 'Keynesians', can learn a thing or two about this important era in the history of economic thought. It is also a book about 'the other side', that is, from the inside of the centre of monetary policy-making, of discussions in their board rooms, meetings and emails with other authorities (advisors, presidents, Treasury secretaries etc). Bernanke often emphasises what he and his co-workers tried to accomplish with various programs, the "bailouts", the quantitive easing and the monetary statements and speeches given in trying to manage and steer the crisis. Above all, it's a book about The Game between politicians, central bankers and the financial markets. Sometimes this game seems to be a high-staked exercise in game theory, where Bernanke & co tries to convey a message to the financial markets, who in turn try to interpret what he's saying, and he in turn interpret and predict what their reactions mean for the economy. The thesis of the book is clearly presented in the title: The Courage to Act. Throughout, Bernanke argues that he and the Fed had the courage to act, and saved the economy from a catastrophe worse than the one experienced during the 1930s. The rest of the 579 pages are details; how they acted when Bear Stearns reported enormous losses in two of their off-balance sheet hedge funds and how Fed negotiated a deal where J.P. Morgan acquired Bear with $29bn dollars of Fed-support; how they struck a deal with Bank of America to purchase the next investment bank about to fall, Merryl Lynch; how they and other authorities failed to save Lehman; how the domino effects and the bank runs of financial firms forced the Fed to do everything in their power to solve crisis after crisis; how the Federal Reserve functions with its regional Reserve Banks and the board (Federal Open Market Committee) sets the Fed funds rate. During his time as chairman both he and co-workers at the Fed did the same exercise again (p. 113, 136, 162) and he repeats several times that the mistake in these analyses was found in a neglect of 'financial stability' and the possibility of bank-runs on investment banks, not covered by federal insurance guarantee – not that these kind of analyses ignores Hayek's warning or appreciates the problems Austrians always raise in regards to Central Banks generally. The height of hubris is the fact that Bernanke, mainstream academia's perhaps most well-read economic historian about bank runs and the 1930's depression, together with some of the smartest economists and econometricians the Fed could gather, didn't have a clue about the imbalances built-up in the financial system through the low-interest rate policy Bernanke and his predecessor Greenspan had run. In an interview with the popular economics podcast Freakonomics, he argues that Fed saw the risks in property market, but did not appreciate how enormous the consequences could be. Despite this somewhat awkward mistake, he takes cred for having saving the U.S. from a much worse crisis, and concludes that Fed's courage to act and create unconventional monetary stimulus (quantitive easing, bail-outs, stimulus packages, and artificial actions to hold down long-term interest rates) was the key to escape the crisis. When he couldn't justify his actions with research or previous experiences, for instance in a meeting with the FOMC in December 2008, the Fed simply had to "give it a try and see what happens" (p. 183). Many more than Austrians choked their morning coffee in reading that. A common problem for legislators and Fed during the financial crisis was the worry about “Moral Hazard“, i.e., the idea that when losses by those who made the worst bets are covered, the future risk of the entire banking system increases. That is because every other bank now sees that higher risk does not only equal "high likelihood of losses", but that "someone else will cover our failures". Socialise the losses and privatise the profits. Bernanke describes the experiences with Fannie Mae & Freddie Mac, the two politically-appointed GSE (Government-Sponsored Enterprises who both have ruined American property markets for decades), with implicit and later explicit guarantees from the American government, all in order to increase the number of home-owners. Not a single time did Bernanke have the decency to ponder whether these "companies" may have had any impact on the property market, or a fundamental reason for why the "lack of regulation" or "greed" he believes caused the crisis (p. 222, 319-322, 437-438, 555) randomly increased leading up to the crisis. In a particularly telling section, Bernanke was unwilling to use Fed's facilities to lend unlimited amount of newly-created currency to Thornburg Mortgage, a highly-leveraged New Mexico financial company, because it may create moral hazard – and since Thornburg Mortgage wasn't large enough to threaten the financial stability. In the middle of the paragraph he mentions how Fannie and Freddie had guaranteed large parts of Thornburgs assets, and they were safe since the government's implicit guarantees supported Fannie & Freddie. But not a single time does the he consider the idea that perhaps the reason Thornburg had leveraged so highly was because the government, via Fannie & Freddie had guaranteed its assets, and that Thornburg at any given moment could sell off its risky assets to them. Not a single time does he consider that markets and incentives change when Fannie and Freddie bought more than a third of all MSB-products launched 2004-2006 (p. 230; even mainstream academics such as the Harvard-historian Niall Ferguson or the UPenn-sociologist Thomas Sugrue argues that the political directives governing GSEs made the authorities accept lower capital requirements and securities for their business, and so contributed and created the very leverage and risky behaviour Bernanke attributes the crisis to). Bernanke completely neglects the unintended consequences of his and Fannie and Freddie's actions. The worst kind of self-deception is visible in Fed's handling of Bear Stearns, CitiBank and Lehman Brothers' potential bankruptcies. Every time they first try to find a private-sector solution that doesn't require government money for bailing out banks. But there's strategic thinking here too; since the owners and managers of these banks know that the Fed is charged with guaranteeing financial stability, and that such guaratees come at even lower share prices, private actors have every incentive to wait until after the government have bailed out the troubled firm before they acquire a position. And if they would agree to the Fed's negotiating pretenses, it could very well be the case that additional actions or emergency loans will be required and the private investor will see his investment rapidly fall in value. Bottom line: just the fact that the Fed exists and have the obligation of 'financial stability' and TBTF, means that private actors are less likely to buy-up troubled companies, and thereby removes a possibility for markets to reduce instability during crisis – a typical example of what Robert Higgs call 'Regime Uncertainty'. In a Fed-free world crisis-time would have been prime shopping time for investors. But instead Bernanke draws the unfathomable conclusion that financial markets were too scared and too risk-averse, which means that the Fed must intervene and correct a market failure (pp. 287-291); ignore the consideration that perhaps this so-called "market failure" was created by government in the first place. If you wanna save yourself 579 pages of Bernanke's life, his self-congratulary attitude, his 'holier-than-thou' arrogance, and details in the political game that is fiscal and monetary policy, you could focus on the last chapter and the epiloque. This is where Bernanke summarises his view on the Fed's task, how his actions during the crisis made the U.S. stronger, and his reasoning about the new legislation and regulation of the financial sector that he contributed to. At the end of everything, he introduces a strange element of humility, almost borderline Austrian, when he accepts that we don't have a counterfactual scenario for how the crisis would have played out in the absence of the Fed. But, he quickly smoothes over, "most evidence" (p. 567) points towards job creation and growth was faster with than without Fed's action, for which he uses international comparisons as evidence – despite the fact that equivalent monetary authorities did similar things the Fed did. In summary, this is an exciting book that mixes Bernanke's personal life with his political achievements. If you can stomache his naive view of the crisis as created by a lack of regulation and by bankers' greed, as well as his somewhat clumsy and lazy academic analysis, it is a book well worth reading: about a smart and hard-working man with benevolent aims but with brutally mistaken convictions and methods at his disposal.